Oats are a cereal grain grown in temperate areas. They grow well in cool climates and can tolerate more rain than other cereal grains. Oats are used as a cereal and in baked goods. They're also commonly used as livestock feed. For baking, regular rolled oats and quick cooking are usually interchangeable in a recipe. If your recipe calls for quick cooking oats and you only have old-fashioned rolled oats, pulse the old-fashioned oats in the food processor a few times. If quick cooking oats are used in a recipe in place of old-fashioned rolled oats, the texture will be different, but that will probably matter very little in most recipes. You can also make oat flour, or ground oats, from oats. All you need is a blender or food processor to make ground oat flour. The gluten-free ground oats can be used to replace flour in many recipes. Whole oat groats are the whole grain of the oats, minus the hulls. They take the longest to cook. Steel-cut oats are groats cut into 2 or 3 pieces with a sharp blade. They cook more quickly than whole oat groats and retain a nice, chewy texture. Scottish oatmeal is a stone ground oatmeal. The groats are ground and broken into small bits. Rolled oats (old-fashioned), are the oat groats steamed and rolled into flakes. This means the oils are stabilized, and the oats stay fresh longer. The larger surface area means they will cook more quickly than steel cut oats. 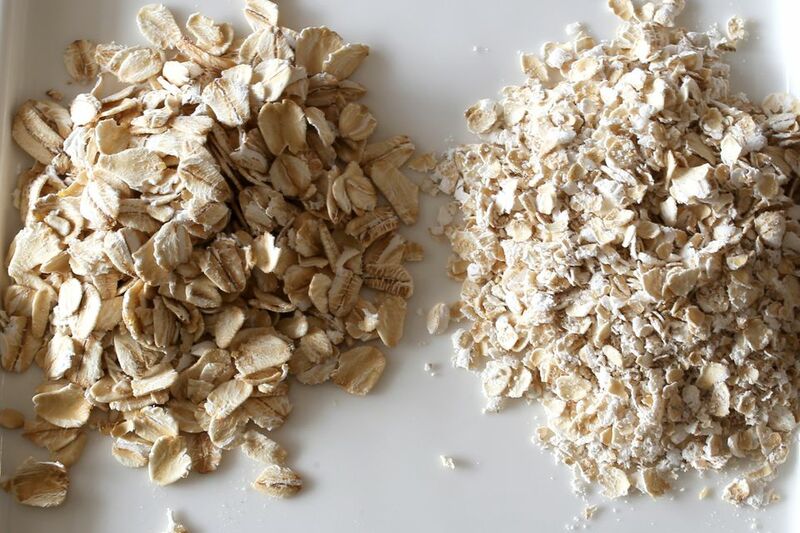 Quick oats are cut into more pieces, rolled thinner, and steamed longer. They will not have as much texture as the rolled oats or steel-cut but will cook more quickly. Instant oats are usually very similar to (if not the same as) quick oats but might be pressed even thinner and cut even smaller. They might become rather mushy when cooked but generally, need very little cooking time. Oat bran is the outer layer of the oat grain, just under the hull. Oat bran is part of rolled oats and steel-cut. Oat bran can also be purchased separately. Oat flour (or ground oats) is sometimes combined with other gluten-free flours for gluten-free baked goods. Oats have a relatively high-fat content and can go rancid if on the shelf for too long. Buy oats in small amounts and store them in a tightly covered container in a cool, dry place. Use oatmeal as a hot cereal, in cookies, or as a filler in meatloaf or meatballs. Add oat bran to your cereal and muffins, and use part ground oats—oat flour—in wheat or gluten-free quick breads, muffins, fruit crisps, and other baked goods.